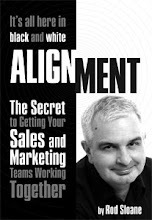 Sales and Marketing Alignment Blog from Rod Sloane: What Overt Benefit does your business deliver? Doug Hall is somewhat of a contradiction. He's a geeky marketeer. A scientist interested in entrepreneurship. Maybe, he was attracted to the Dark Side? In his book “Jump Start Your Business Brain” Hall introduces the concept of the the Three Laws of Marketing Physics. See, I told you it was geeky. Hall's first concept is that we should always offer an Overt Benefit, that answers the question What's in it for me? Can you answer that in a way that is meaningful, specific and measurable. Not in some woolly, namby-pamby way like we build websites or put ink on paper. What hard benefit do you offer clients. Can you deliver profitable new clients in 13 weeks? Can you save me 33.5% of my tax bill? Can you make me 3 stone lighter in 3 months? These results are specific make what you do the same? I can show you how to increase your revenue by 15% in 17 weeks and double it in 23 months.